Figure A17. Bitlis anomaly, interpreted as the Bitlis slab, with (horizontal) [vertical] cross sections through (A)[D] the UUP07 p-wave) and (B)[D] the combined SL2013 and S40RTS s-wave models at 470 km; C) the location of the modern geological record that we interpret to have formed during the subduction of the slab. 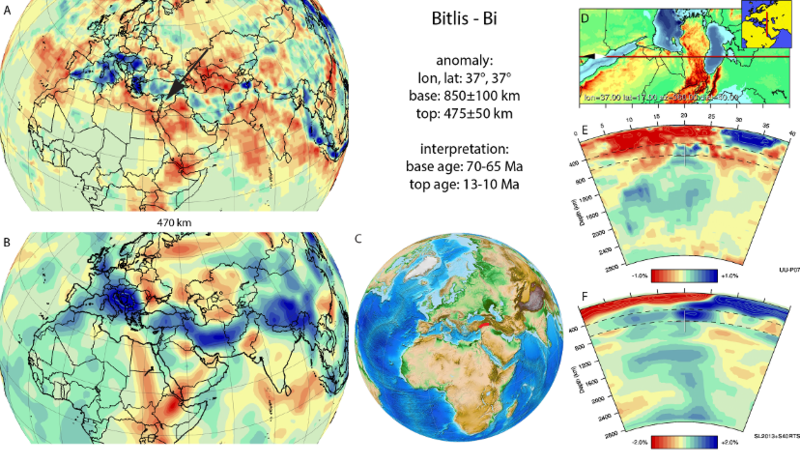 The Bitlis anomaly (Figure A17) is detached and is located below southeast Anatolia in the upper mantle and uppermost lower mantle. It was identified by Zor (2008), as the western Lh1 anomaly, which forms in his model a narrow band just south of the modern Bitlis suture. Other tomographic models published in Faccenna et al. (2006), Hafkenscheid et al. (2006), Lei and Zhao (2007), Biryol et al. (2011), and Skolbeltsyn et al. (2014), or the UUP07 model (Figure A17) do not show such detail, but consistently show an anomaly lying on the 660 km discontinuity, interpreted by these authors as detached lithosphere (Bitlis slab). Our model, as well as Hafkenscheid et al. (2006), suggests that the Bitlis slab penetrates the 660 km discontinuity. We interpret the Bitlis slab between 440 and 920 km depth. Break-off of the Bitlis slab is widely interpreted to have occurred at 13-10 Ma ago, which corresponds to the end of deep-marine sediment deposition in the suture zone, a rapid phase of erosional denudation of the Bitlis massif, and a volcanic flareup in eastern Anatolia (Keskin, 2003; Sengör et al., 2003; Faccenna et al., 2006; Hüsing et al., 2009; Okay et al., 2010). The onset of subduction of the Bitlis slab is more difficult to assess. In late Cretaceous time, ophiolites were obducted onto northwestern Anatolia in southeastern Turkey, Syria, and further west in Cyprus and southern Anatolia. These ophiolites formed since ~95 Ma as reflected by crustal crystallization ages and cooling ages of metamorphic soles, and uppermost Cretaceous, ~70-65 Ma sediments unconformably cover the obduction thrust (Al-Riyami et al., 2002; Kaymakci et al., 2010; Karaoğlan et al., 2012; 2014). We interpreted this obduction to reflect the end of subduction of the western part of the Arabia slabs with a top at ~1100±100 km, to the south of the Bitlis slab. Moix et al. (2008) and Maffione et al. (2017) suggested that obduction of these ophiolites followed upon westward radial roll-back of an east-dipping subduction zone into the eastern Mediterranean region, which would have been accompanied by the opening of a back-arc until ophiolite obduction. The Bitlis slab probably represents lithosphere of this back-arc, with subduction starting at or after ~70-65 Ma, which we adopt for the age of the base of the Bitlis slab.